Today: I maintained the integrity of my maintenance calorie budget, I remained refined-sugar free, I exceeded today's water goal, and I stayed connected with good support. The next episode of Transformation Planet featuring Dr. Joan Ifland is coming tomorrow evening! This is one of the projects I've been working on lately. And mainly, I've been working on outlining a more doable and sustainable production process that'll enable me to maintain consistency in releasing new episodes. Sounds familiar, huh? I suppose making something doable and sustainable supports consistency in just about anything. Many exciting things are coming soon in the New Year. The next session of the Better Weigh Accountability and Support Groups I cofacilitate with Life Coach Kathleen and Jordan Burgess starts January 29th and 30th and we have room for you! Details about registrations coming very soon! I'm looking forward to an amazing 2018. I'm super-optimistic and ready to take the actions I must in order to experience the year I envision!! We had a special New Years Eve this afternoon and evening. Mom and Noah enjoyed seeing Ferdinand--and so did I! It was a fun movie! 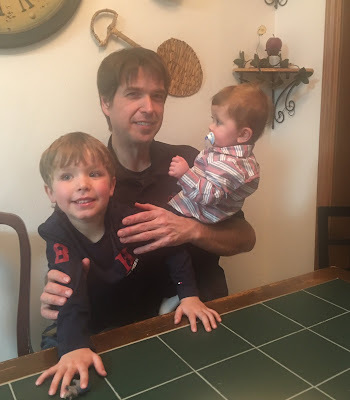 We met up with my youngest daughter, Lucas, and Oliver for dinner out at our favorite little Mexican restaurant before getting mom back to her warm room. It's very cold here! Not as cold as other parts of the country--but 10 degrees Fahrenheit is frigid for us! Have a safe, happy, and warm New Years Day! Today: I maintained the integrity of my maintenance calorie budget, I remained refined sugar-free, I exceeded my daily water goal, and I stayed connected with support. Time doesn't really care what we do. Time keeps moving right along like clockwork because it is clockwork. No matter what we do in the next twelve months, it's still going to be 2019 in one year. Time is consistent. I wanted to be consistent too. I had to dig deep in order to wrangle my impatient personality. I finally realized: I really needed to forget about time. Time doesn't need me to worry about it, it'll keep moving right along without any help or hindrance. I was starting at over 500 pounds, so naturally, I thought a lot about the time I needed--and the time I hoped to have. You never know how much time you have left when you've been morbidly obese your entire life. I didn't start making consistent progress until I shifted my focus away from time and moved it instead to what I needed to do each day to succeed just one more day. Mom was super-nervous about her dentist appointment today. 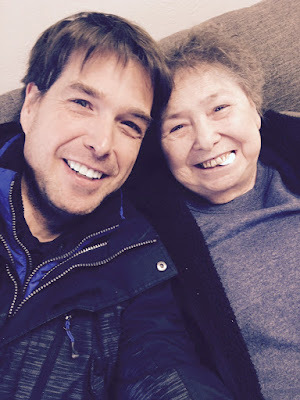 She hadn't had a dental procedure like this since 1990, as best she can recall. But all ended well and she's back at her place, medicated and resting well! Relaxing for a few minutes after her procedure! Monday starts a brand new year. It's a brand-spankin' new opportunity to create the year we most desire! But I will not make a New Years Resolution. I don't have a good history with New Years Resolutions. Oh, I once proclaimed all kinds of New Years Resolutions--big, grandiose-- huge expectations, but mostly these resolutions were in name only--rarely was there a sustainable action plan to support these amazing declarations. Weight loss New Years Resolutions--oh my, never, ever worked for me--ever. My nine years plus experience along this road didn't start with January 1st--it was September 15th, 2008. The high expectations I put on my shallow resolutions never resulted in the big positive changes I wanted--in fact, when the resolutions were shattered, I ended up feeling worse than before I made the resolution...and these negative emotions would keep me firmly in a down position until the next burst of inspiration prompted a repeat of this pattern that kept me over 500 pounds for almost two decades. If you make a New Years Resolution--awesome!!! But, the most important thing you can do is create an action plan that's supportive, sustainable, and in harmony with your goal. The action plan part was always missing for me on New Years Day. I'd make the grand declaration in front of everyone--then, I'd go to bed and expect to wake up a completely different person. And it doesn't work that way. My best advice is: Consistency Beats Intensity. And the number one way to achieve consistency is by way of simplicity. Keep it simple!!! Simple, simple, simple...It is crucial to maintaining consistency. We're the ones who make the rules--if we keep the rules simple to follow--then our chances of maintaining consistency goes up dramatically. And as we develop along the way--we can get as fancy and as specialized as we want and need, when we're ready. It's a natural evolution of good choices. Not a sudden and dramatic change where we expect to be a completely different person as soon as we wake up to our pre-determined start day. Don't be afraid to start small. Starting small and simple is a path to sustainable and consistent positive results. If you'll apply the patience needed for this approach and forget about the time it takes, you'll discover something amazing. Your "You Plan" will evolve in a very natural fashion. Your consistent positive progress will make your positive visualizations more believable because you'll clearly see where this is headed!! And where you're headed is a place where freedom lives. All kinds of freedom; physical, emotional, psychological, and more! My focus on consistency isn't long term. It's today. I want to make today a good day. I want to hit the pillow tonight, knowing that I gave it my best shot--my honest to goodness, best. Not perfect, mind you--rather, the best I could do today. I want to do that again tomorrow. It feels good!! Big-time accomplishments are not done all at once. It's a collection of much smaller accomplishments contributing in a positive way to the bigger goal ahead. Set small, doable goals--and hit them square with everything you can. And acknowledge your accomplishments along the way. Feel good about you!!! You'll get back some wonderful results in return. This whole thing is really the age-old tale of the tortoise Vs. the hare. You remember who won that race? The consistency of the tortoise beat the over-confidence and intensity of the hare. You get what you give. Just try to make sure what you're giving is something you can keep giving--something doable for you--something sustainable, something to get excited about!!! Surround yourself with support. Be kind to you. Remember: This isn't about perfection, it's about progress. One of the biggest barriers can be that voice inside our own head--the mental chatter speaking negatives and untruths. You can shut that voice down when you take it slow, steady, small, and simple. You'll gain consistency and lose weight. If your New Years Resolution is to lose weight--great!!! YOU CAN DO IT. Think about this: Can you imagine this being the last time you ever feel compelled to declare this resolution? Today: I maintained the integrity of my maintenance calorie budget, I remained refined sugar-free, I exceeded my daily water goal, and I stayed connected with good support. Sean, Merry Christmas! Will you be doing any posts about how to create an action plan; what makes an action plan executable; how to monitor; etc? This is exactly where my headspace is right now. I've used the holiday to relax a bit and clear out the emotional and mental clutter of the last 12 months. I'm in the space to set up a whole new plan for the year. So far I'm most of the way through selecting my goals and really getting down on paper what that looks like. Now I'm sort of stuck with the actionable steps/tasks and what to put in motion first. Thinking about a full year at once is becoming a bit overwhelming so I'm going to tackle it in seasons/quarters. I would love any insight you have on this whole process, especially given your success with maintenance. What are some of the highlights of your plan and how do you make it work? Thank you, and Merry Christmas to you, too! I'm absolutely planning an extensive dive into this very topic tomorrow night! I love how you're dividing your goals into smaller periods of time! For me, it comes down to a set of boundaries for each day. I'll explain more in tomorrow night's edition. I'm looking forward to writing that one! I'm taking advantage of time off from work--and relaxing quite a lot. Mom joined me this evening at Ground Round down the street for the OSU-Virginia Tech bowl game. We didn't stay for the entire game, instead, we finished her Christmas shopping at Walmart. She received a gift card she was ready to spend! I'm enjoying the time off from work! Not setting the alarm for 4:30am until Monday night is a wonderful thing. I got some things done today, prepared some good food, enjoyed a visit with mom tonight, and exchanged a gift for my grandson. I'm using this time off to assemble my action plan for 2018. I will plan a good one! Taking a break and doing a Tweets only tonight. Today was all about visiting, taking pictures, watching Noah lose his four and a half-year-old mind because he was overwhelmed with excitement, and much more! That was a lot of fun. I played a game of Doggy Doo with Noah. It's a game where you feed the dog, then roll the dice--the higher the number the quicker the dog does his business. The person who cleans up three doggie doos first, wins. I know, strange. What happened to Shoots and Ladders, or Sorry, or The Game of Life, or Yahtzee? He loves playing Doggie Doo. He opened Pie Face too! It's a game where you get smacked in the face by a big dollop of whipped cream. These are games all the four-year-olds are raving about! He wanted Pop The Pig, a game where you feed the pig until its stomach bursts. He didn't get that one. It was a very special day. A few things I made important today--and each one helped make it a good day: 1. I focused on my gratitude list. 2. I also focused on the people around me and not the food. 3. I offered my support to others throughout the day--and enjoyed a few awesome support exchanges as a result! Food wasn't the star of the show, but let me tell you--It was good, too. By special request, I made my super calorie dense macaroni and cheese for today's dinner. I measured out a small 1/2 cup portion for 180 calories. The reviews started flying across the room, "this is the best macaroni and cheese in the world!" I enjoyed hearing and seeing how much the dish was appreciated! At the end of the day, I declined to take any of it back to my apartment--I know myself better than to allow that stuff in my living space!! No thank you--it's a calorie bomb!! Or simply, as I say--not a good calorie value! It was divided up and handled by others--and that was perfect. I remembered to bring an apple for my dessert today. I sliced it and baked it with cinnamon--and oh my, it was perfect (see Tweet below). My two amazing daughters and me! My grandsons, Noah and Oliver. Totally adorable! I love any picture that contains my mom smiling. Today: I maintained the integrity of my maintenance calorie budget, I remained refined sugar-free, I met my daily water goal, and I stayed connected with support. I slept in very well today! It felt amazing to sleep until I didn't want to sleep. My day was tilted somewhat. I finished some work at studio before embarking on a daring adventure through the narrow crowd-filled isles of Walmart. I had shopping to finish. I survived. It was 5:30 before I made it back home. The plan for dinner was a meal out after touring more Christmas lights with my oldest daughter, her hubby, and mom. We were disappointed to find the one restaurant that would be the most likely to stay open, closed early. It was okay-- I waited until our Chritsmas Eve visiting was finished before heading home for a late dinner. Tomorrow, it's Christmas dinner and the family gift exchange! 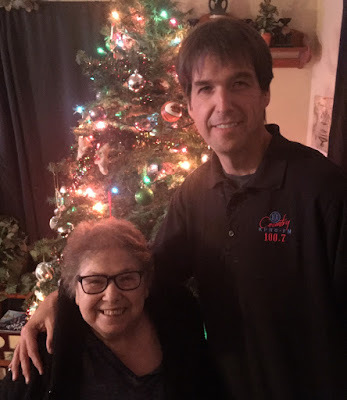 I picked up mom this afternoon for a trip she's been looking forward to taking. We visited our hometown for shopping and dinner out with her brother, sister, and brother-in-law. It was a great visit! Afterwards, we toured the downtown Christmas lights and cruised a couple of neighborhoods known for their all-out Christmas light displays. Truly a fantastic Christmas weekend experience. I've been in maintenance mode for quite a while and I'm extremely grateful for the blessings it continues to give each day. Sometimes I like to visit the archives of this blog to go back in time a year or two, sometimes more, to the day--just to see what things were like back then. It's like time traveling! It's easy because this is a daily diary! I found an interesting post from exactly two years ago--so if you don't mind, I'll share those thoughts in a republish tonight! I couldn't be more pleased with how maintenance mode is proceeding. That kind of sounds like a removed perspective, as if I'm watching it unfold instead of being in the middle of it all. I'm certainly in the thick of it each day. More than once I've heard a variation of "maintenance is happening so easily for you." It's meant as a compliment, so I don't launch into describing the structure that keeps me well. I simply say, "thank you, I'm very grateful." And I am, immensely blessed and tremendously grateful. I have the heart, desires, behaviors, reactions, and chemistry of a 500-pound man. 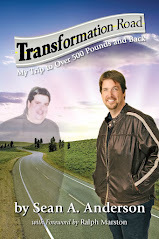 My body, without a structured plan, influenced by all I am, will march directly back to over 500 pounds. Is it scary? No. I have a spiritual peace with it all. I've been down this road, I've been humbled to a place and level I felt was the point of no return and somehow, through the grace of God, made it back to where I am today. My place here isn't guaranteed forever. It is dependent on my willingness to do what is required. I have fully embraced and accepted what is required of me to continue enjoying this multi-faceted freedom. And it's in this acceptance and embrace where I find the peace and calm affording me the ability to carry on another day and another...and another. I don't proceed each day kicking and screaming or whining about how life isn't fair because my normal isn't the normal I wanted. They get to eat whatever they want without ever weighing or measuring any of it--they don't log it and they dang sure don't photograph and tweet it---and they eat sugar whenever they fancy. And they never gain a pound!!! That's great for them! That's their normal. I can try to live their normal, but it wouldn't end well. I would completely lose myself along the way. I accept and embrace my normal and suddenly I discover the truest sense of harmony. I ran into an acquaintance in the meat department of the store who shook my hand and was clearly in shock over the physical side of this transformation. He doesn't read this blog. I know he doesn't because he asked if I had purchased a weight loss plan of some kind. "Is it something you bought?" No, not literally. Figuratively, perhaps. I fully invested in the idea that it was possible without purchasing a predetermined plan or product. 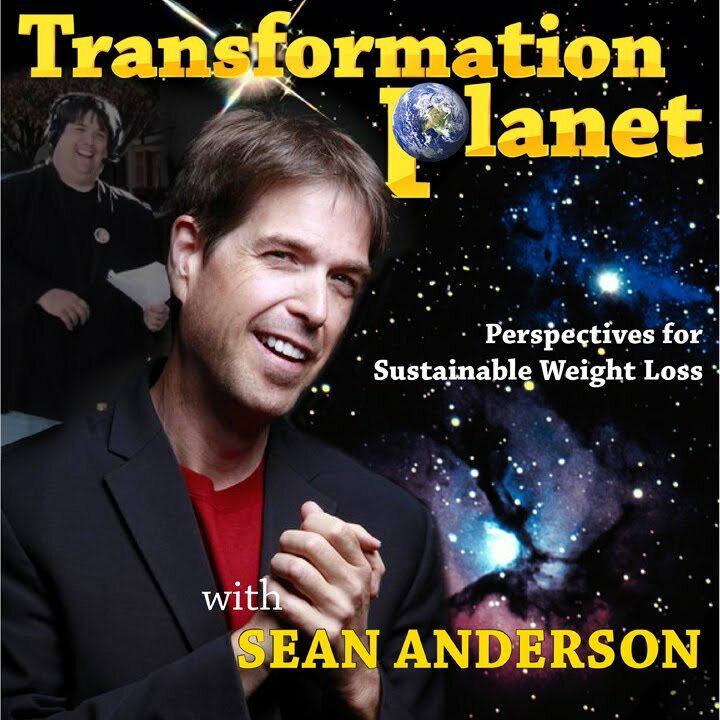 This "magic plan/product" perspective is a product of decades of weight loss industry marketing that has done a very good job at convincing millions they need this plan or that plan, this product or that pill, or shot or whatever. And many of these things work. And they work well. The manufacturers/creators of these products base their formulas and procedures on proven science. And they make millions and some make billions of dollars. Rarely do they consider the most critical element of them all: The human element. The human element is where it gets real. And when it gets real, truths are revealed. Ultimately, these truths, rejected, determine how it all goes regardless of the science involved. These truths accepted and embraced, have the ability to change everything for that person--different from any other weight loss or maintenance attempt. But all of that doesn't matter to the weight loss industry because at the same time it's becoming real for many, many more are reaching the point of desperation...and another sale is made. It's an industry fortified and nurtured by our ability to believe in a product more than we believe in ourselves. And we gotta believe that the spiritual, mental, emotional and the elemental tools needed, exist for each of us. I believe they do. They're not all the same. Our combinations are all slightly different. But they exist for me and they exist for you. Today: I maintained the integrity of my maintenance calorie budget, I remained refined sugar-free, I exceeded my daily water goal, and I stayed connected with support! It was a good day. An insanely busy day--but all is well, I'm here and okay! The past few days have been the most involved in what is annually the busiest week of our broadcast year. The good news is, it's mostly done. Officially, I'm off until January 2nd, technically I still have work to finish. The difference is I'll be able to do that work on my schedule. No 4:30am alarms for me until next year! I'm looking forward to the time off. When many things are crazy, chaotic, and uncertain, I'm faced with a choice. If I choose to communicate with support contacts, plan well, and carry a good measure of honest awareness--then I really can have one thing where I feel peaceful, calm, and certain...and that's what I get when I make my maintenance food plan important each day, come what may. I made homemade low-cal onion rings tonight. The simple little recipe is in the Tweet description below. I paired it with a steak gifted me from a colleague this morning. I'm planning on sleeping in tomorrow morning, for sure!